A regular breeding resident and migrant; regular in winter, when it is most commonly found along open waters in southern Minnesota and occasionally farther north. The Wilson’s Snipe was a common species during the Minnesota Breeding Bird Atlas (MNBBA). The Wilson’s Snipe’s breeding range extends across much of Canada and the northern tier of states from the Pacific Northwest, where it resides year-round, east through the northern Great Plains, Great Lakes region, and New England. It reaches some of its highest breeding densities in the grasslands of North Dakota, Manitoba, and Alberta (Figure 1). Ranked as a species of Least Concern by the U.S. Shorebird Conservation Plan Partnership and assigned a Continental Concern Score of 9/20 by Partners in Flight. Wilson’s Snipe is a hunted species in the United States and Canada. Although some birds overwinter, the majority of birds are medium- to long-distance migrants that winter from the southern United States to northern South America. Their impressively long bills are used to probe wet soils for a variety of invertebrates; larval insects are particularly important. A shallow ground depression lined with grasses; some grasses or small shrubs may form a canopy. Breeding distribution and relative abundance of the Wilson’s Snipe in North America based on the federal Breeding Bird Survey, 2011-2015 (Sauer et al. 2017). Roberts’s 1932 account of the Wilson’s Snipe provided little clarity about the species’ status in the state. Noting that the bird was an abundant spring and fall migrant, he added, “a considerable number remain to nest throughout the state.” Further into the account he wrote, “Wilson’s Snipe nests rather uncommonly throughout Minnesota.” Most of the account, however, is a description of the bird’s spectacular courtship flight and provides little additional information on the species’ distribution and abundance. At the time of his writing, nests had been found in only 3 counties: Hennepin, Polk, and Sherburne. The behavior of adults heard and observed at sites in Anoka, Pine, and Kittson Counties also suggested the birds were breeding nearby. Together the records suggested a rather broad distribution, at least through the central and northwestern regions of the state. In 1975 Green and Janssen provided additional clarification, writing that the species, then known as the Common Snipe, could be found statewide but was most abundant in the north-central region and in adjacent counties to the east. Far fewer reports were available from the southeast and southwestern corners of the state. They added 8 counties to Roberts’s list of counties where nesting had been confirmed: Aitkin, Anoka, Martin, McLeod, Mille Lacs, Nicollet, Ramsey, and Winona. Janssen (1987) included a distribution map in his updated account that depicted the species’ range as confined largely to counties north of the Minnesota River. He also delineated 11 counties where nesting had been confirmed since 1970; all but 1 (Goodhue) were north of the Minnesota River: Aitkin, Beltrami, Crow Wing, Goodhue, Lake, Marshall, Mille Lacs, Polk, Stearns, St. Louis, and Wadena. Hertzel and Janssen (1998) later added 5 additional counties to the list, again all north of the Minnesota River: Kandiyohi, Morrison, Otter Tail, Pennington, and Wilkin. The Minnesota Biological Survey (MBS), which began fieldwork in the late 1980s, reported a total of 687 breeding season locations for the species. The highest density of records was in the Tallgrass Aspen Parklands Province followed by the Laurentian Mixed Forest Province. Although records were sparse south of the Minnesota River, they were most common in the Prairie Coteau region of southwestern Minnesota (Minnesota Department of Natural Resources 2015). MNBBA participants reported 1,728 Wilson’s Snipe records in 23.5% (1,122/4,784) of the surveyed atlas blocks and in 27.1% (633/2,337) of the priority blocks. Breeding evidence was documented in 17 blocks (Figures 2 and 3; Table 1). The birds were observed in 70 of Minnesota’s 87 counties (1 block straddled Nicollet and Le Sueur Counties) and were confirmed breeding in 13 counties, all north of the Minnesota River. Five of the counties where nesting was confirmed were new to Hertzel and Janssen’s list (1998): Big Stone, Kanabec, Koochiching, Lake of the Woods, and Roseau. Overall, the Wilson’s Snipe was most abundant in northern Minnesota, from the Tallgrass Aspen Parklands Province east throughout the Laurentian Mixed Forest Province. MNBBA records indicated that although the species is sparsely distributed in southern Minnesota, when present, the birds are most frequently encountered south of the Minnesota River along the South Dakota border. The dense cluster of atlas records in northern St. Louis County was contributed by MNBBA volunteer Steve Wilson, who was driven to assess how much of the local landscape was occupied by snipe. Clearly that region of the state, with its extensive wet meadows and peatlands, provides ideal habitat for the species! Observations by resource professionals and birders alike over the past 100 years have added considerable clarity to Roberts’s original, rather vague description of the snipe’s distribution and abundance in Minnesota. It is difficult, however, to discern if there have been any significant changes in that time period. East of Minnesota, the southern periphery of the species’ breeding range appears to be receding. The decline in southern Wisconsin began as early as the late 19th century but continues today (Cutright et al. 2006). In Ontario there was a significant decline in the number of observations in three of the province’s most southern regions, including a 44% decline in the Carolinian region (Cadman et al. 2007). In Michigan, the number of observations during the state’s second atlas declined by 40%, the greatest decline occurring in the southern Lower Peninsula (Chartier et al. 2013). Increased development and wetland drainage appear to be contributing to range contractions. West of Minnesota, however, Wilson’s Snipes are faring quite well throughout the northern Great Plains, where populations are significantly increasing, including in nearby South Dakota (Drilling et al. 2016; Sauer et al. 2017). Although the Wilson’s Snipe has long been considered a species with a statewide distribution, the MNBBA predicted distribution map predicts the highest breeding densities are found in the Tallgrass Aspen Parklands Province of northwestern Minnesota, especially in eastern Kittson and western Roseau Counties (Figure 4). Scattered pockets of abundance are found throughout the western region of the Laurentian Mixed Forest Province as well, with a concentration of birds in the Pine Moraines and Outwash Plains Subsection. The area of the 2007 Ham Lake fire north of Grand Marias is a site with especially suitable habitat. Breeding distribution of the Wilson's Snipe in Minnesota based on the Breeding Bird Atlas (2009 – 2013). Summary statistics of observations by breeding status category for the Wilson's Snipe in Minnesota based on all blocks (each 5 km x 5 km) surveyed during the Breeding Bird Atlas (2009-2013). Summary statistics for the Wilson's Snipe observations by breeding status category for all blocks and priority blocks (each 5 km x 5 km) surveyed during the Minnesota Breeding Bird Atlas (2009-2013). Predicted breeding distribution (birds detected per 10-minute point count) of the Wilson's Snipe in Minnesota based on habitat, landscape context, and climate data gathered during the Minnesota Breeding Bird Atlas (2009-2013) using the General Linear Modeling method without an adjustment for detectability. Surprisingly little has been written to describe details of the Wilson’s Snipe’s breeding habitat. A shallow wetland inhabitant, the species appears to have two basic requirements: soft organic soils that supply an abundance of invertebrates within probing distance, and patches of clumped vegetation that are dense enough to provide cover but still provide a view of approaching predators. Because the snipe’s eyes are set so far back on its head, the bird has an advantage in being able to see in front, to the side, and quite far to the back (Mueller 1999). Tuck’s (1972) original monograph on the species broadly described the species’ habitat as sites with organic soils, mostly peatlands, which occur within the boreal forest region. Suitable habitat ranges from open bogs with little tree growth to alder-willow swamps, wet meadows, the riparian edges of rivers, open-water wetlands, and pastures (Figure 5). Dense cattail marshes are usually avoided (Mueller 1999). Cutright and colleagues’ (2006) detections of the Wilson’s Snipe during Wisconsin’s first atlas were largely associated with three wetland communities: (1) open marshes with > 25% emergent cover, (2) shrub lowlands, and (3) sedge meadows. Habitats within 200 m of MNBBA point counts where Wilson’s Snipe were detected were predominantly shrub wetlands followed by wet meadows and peatland bogs (Figure 6). The species’ presence on the Ham Lake fire region of northern Cook County also demonstrates its use of wet forest openings (Figure 2). Typical breeding habitat of the Wilson’s Snipe in Minnesota (© Lee A. Pfannmuller). Habitat profile for the Wilson's Snipe based on habitats within 200 m of point counts where the species was present during the Minnesota Breeding Bird Atlas (2009-2013). Solid estimates of the population size of Wilson’s Snipe are lacking and range from as low as 2 million breeding adults (Andres et al. 2012) to as high as 47 to 82 million (Mueller 1999). Most shorebird biologists use the low, conservative population estimate of 2 million birds. This number has been reviewed and reassessed on two separate occasions (Morrison et al. 2006; Andres et al. 2012) since it was first established by the U.S. Shorebird Conservation Plan in 2001 (Brown et al. 2001). Both times the reviewers commented that no new information was available upon which to base recommending any changes to the original, conservative estimate of 2 million adults. In 2006 shorebird biologists also noted that the Wilson Snipe harvest in the United States had decreased from approximately 600,000 birds per year in the mid-1970s to about 200,000 per year in the early 2000s. During the same time period, the harvest in Canada declined from roughly 100,000 birds to 10,000 (Morrison et al. 2006). These statistics, they believed, suggested a population that numbered in the low millions. In 2012, when the second review took place, the combined annual harvest in the United States and Canada had stabilized at approximately 105,000, while federal Breeding Bird Survey (BBS) data suggested a steady to slightly increasing population (Andres et al. 2012). The BBS, the gold standard for monitoring land bird populations, was deemed less than adequate for shorebirds dependent on wetland habitats (Arnold 1994). Despite their limitations, BBS data show a long-term stable population from 1966 to 2015 across the BBS region (Sauer et al. 2017). In Minnesota the long-term trend demonstrates wide fluctuations but overall is relatively stable with an average, nonsignificant, annual increase of 0.55% since 1967. These data also suggest a declining statewide trend in recent years, from 2005 to 2015, although the trend remained highly variable (Figure 7). Wetland conditions are believed to be responsible for much of the annual variability (Mueller 1999). In contrast, the National Forest Bird (NFB) Monitoring Program on the Chippewa and Superior National Forests revealed a significant increasing snipe population on the Chippewa National Forest from 1995 to 2016. On the Superior National Forest, the population has been stable, as has the combined regional population trend (Figure 8). Although it is a relatively common species in Minnesota, breeding densities are much higher west and north of the state (Figure 1). The average number of snipe observed per BBS route in Minnesota each year is 3 to 4 birds; in Canada’s Boreal Taiga Plains region, which stretches from central Manitoba northwest to the Northwest Territories, the average number of snipe observed per route is 16 (Sauer et al. 2017). 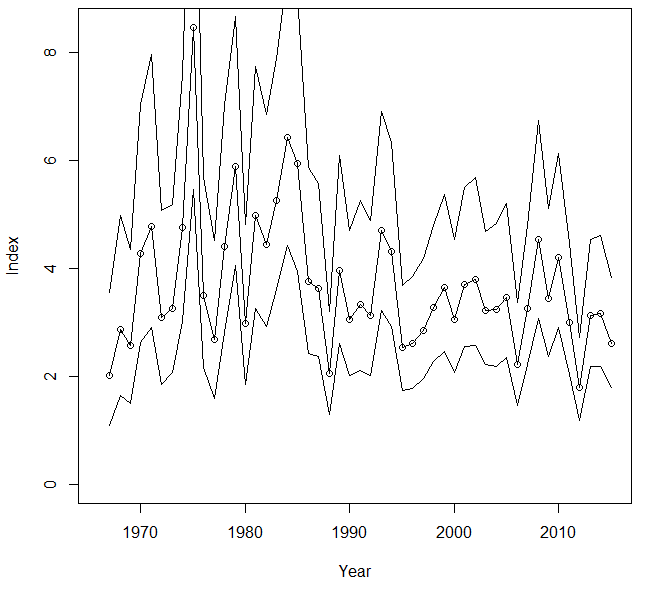 Breeding population trend for the Wilson’s Snipe in Minnesota from 1967-2015 based on the federal Breeding Bird Survey (Sauer et al. 2017). 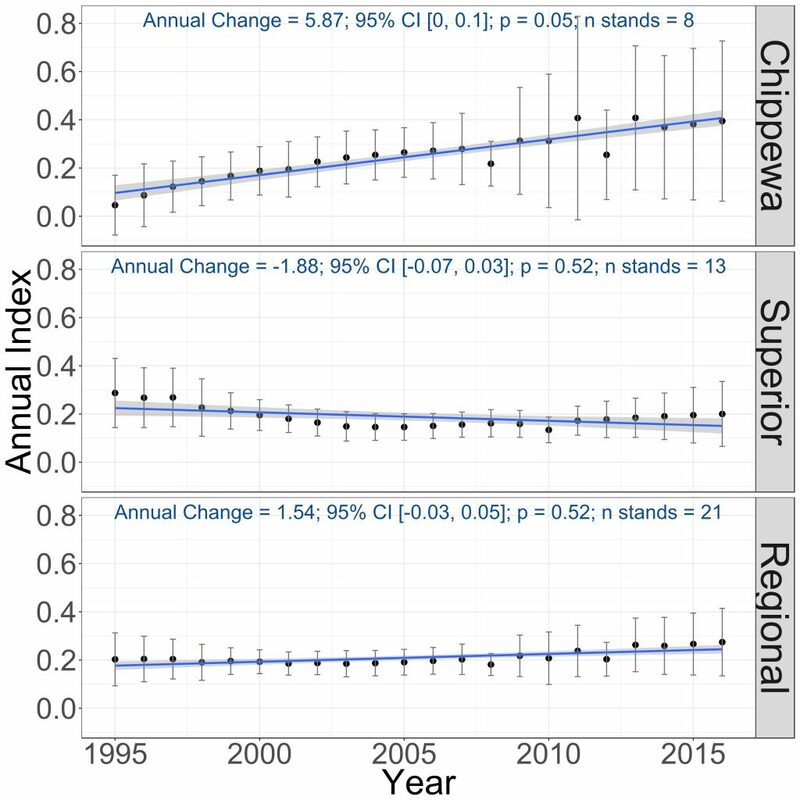 Breeding population trends of the Wilson’s Snipe in the Chippewa and Superior National Forests and the combined regional trend, 1995-2016 (Bednar et al. 2016). The Wilson’s Snipe is not considered a high conservation priority at either the state or federal level. The U.S. Shorebird Conservation Plan rated it a species of Moderate Concern in 2001 (Brown et al. 2001) and further down-listed it in 2015 to a species of Least Concern (U.S. Shorebird Conservation Plan Partnership 2016). Brown et al. (2001) established a population target of 4,345,000 birds, which represented an estimate of the species’ population in 1950. More recently, the species was assigned a Continental Concern Score of 9/20 (Partners in Flight, Rosenberg et al. 2016). Specific conservation measures are largely lacking. Today, few hunters concentrate solely on snipe but rather harvest the bird incidentally when they are hunting their primary target, waterfowl (Arnold 1994). The total U.S. harvest in the fall of 2015 was estimated at only 44,500 birds, nearly half of the 94,900 harvested the previous season (Raftovich et al. 2016). This number is significantly lower than the 422,000 estimated average annual harvest from 1964 to 1976 (Martin 1979), suggesting a decline in interest among upland game hunters. In Minnesota the 2015–2016 harvest was estimated at just 223 birds (Dexter 2016). Mirroring the trend observed nationally, a steady decline has occurred in the state in the number of individuals hunting snipe, the average number of birds bagged each year per hunter, and the total harvest (Figure 9). Despite the low numbers, Minnesota is one of seven states where significant harvest occurs. The others are Wisconsin and Michigan during the fall migration and California, Florida, Louisiana, and Texas during the winter months (Raftovich et al. 2016). Arnold (1994) noted that among the most pressing needs for effectively managing and protecting Wilson’s Snipe populations are reliable population data on the breeding grounds, improved estimates of harvest levels during migration and winter, and better information on the conditions of habitat on the wintering grounds. The species has not been examined closely for its vulnerability to climate change, but a cursory review in 2010 assessed the species’ vulnerability as low (North American Bird Conservation Initiative 2010). A wetland-dependent species, the snipe relies on the protection and restoration of wetland habitats, especially outside of the boreal forest region, where a much greater percentage of this critical habitat has been lost or severely degraded. Russell and his colleagues (2016) recommend maintaining a network of shallow wetlands that provide open, shallow waters interspersed with mudflats in order to provide high-quality nesting habitat. 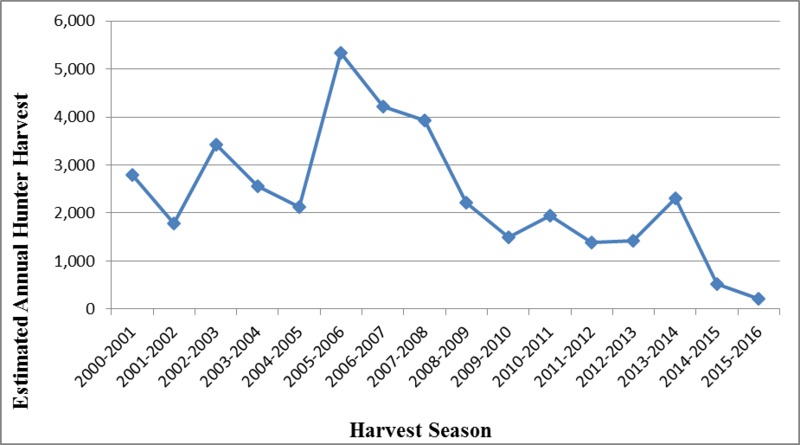 Estimated annual harvest of Wilson’s Snipe in Minnesota from the 2000/2001 hunting season through the 2015/2016 hunting season (Dexter 2011; 2016). Arnold, Keith A. 1994. “Common Snipe.” In: Migratory Shore and Upland Game Bird Management in North America, edited by Thomas C. Tacha and Clait E. Braun. Lawrence, KS: Allen Press. Martin, Elwood M. 1979. Hunting and Harvest Trends for Migratory Game Birds Other than Waterfowl: 1964–76. Special Scientific Report – Wildlife 218. Washington, DC: U.S. Department of the Interior, Fish and Wildlife Service. Tuck, Leslie M. 1972. “The Snipes: A Study of the Genus Capella.” Canadian Wildlife Service Monograph, Series 5. Ottawa: Canadian Wildlife Service.